CoinSutra welcomes you to another Bitcoin hard fork mess! And when I say “mess”, I mean it more than ever. In a recently concluded Bitcoin hard fork (i.e Bitcoin Cash), we witnessed the ebbs and flows of being a Bitcoin investor. And now, again, the Bitcoin ecosystem, including every type of entity connected with it, is being tested because we have another Bitcoin hard fork scheduled for this November. I know some of you might wonder why this is happening because Bitcoin has already scaled, activated SegWit, and Bitcoin Cash supporters have already parted their ways with bigger block sizes. Well, my answer is simply that the Bitcoin scaling debate is not over yet! For those of you who have been reading CoinSutra diligently, you will know about the unconcluded story of the New York Agreement. And now, this unconcluded story is about to reach its climax. What Is NYA or SegWit2x? NYA (aka New York Agreement or aka SegWit2x) is a Bitcoin scaling solution that was signed and agreed to by a large number of miners, developers, and investors in Consensus 2017. SegWit2X is a fancy derivative name given to a combo of scaling solutions (i.e SegWit and 2MB block size increase). It simply means implementing SegWit first, and then within 3 months of SegWit activation, it aims at implementing a 2MB block size for the Bitcoin network. And since SegWit2x’s first leg (i.e. BIP 91 (SegWit)) was already put in place on July 21, 2017, the last and final leg is still pending. Why Is This Fork Happening? Now the present mess is about the implementation of the 2MB block size (which is happening in mid-November 2017). But as I have described in my Bitcoin Improvement Proposal article, 2MB blocks will be implemented only when core developers and other players support this idea. But it doesn’t look like many of them will be supporting it, and so we are having yet another hard fork lingering over Bitcoin. When Is This Fork Happening? This fork is happening on the 18th of November 2017. The exact time is not known yet, but it is scheduled to go live from block height 494784. And according to Blockchain.info at the time of this writing, the Bitcoin network is currently sitting at 489179 block height. So you can see that we are only a few thousand blocks away from the SegWit2x hard fork. From this threshold block height, Bitcoin’s blockchain will be diverging into two different directions with two different rules onto two different blockchains. Are Your Coin Holdings Doubling? If this fork happens, then everyone who was holding Bitcoin before the fork will have an equivalent number of these new SegWit2x coins. Note: This doesn’t mean that your value of coins will double. Those who were present at the Bitcoin Cash hard fork ceremony will surely understand this. But there is a problem…! I want to address this problem loud and clear for both those who were present and those who were not present during the Bitcoin Cash fork. SegWit2x will not have replay protection like Bitcoin Cash had. It will rather have an opt-in replay protection in place. This is so because the SegWit2x supporters and a SegWit2x developer (Jeff Garzik) have clearly stated that SegWit2x is not an altcoin, and it will be a Bitcoin upgrade. For the uninitiated, replay protection is a technical update that stops the same transaction from being broadcast on both chains. (Read in detail about replay attacks). Due to this, SegWit2x is being highly criticized by legacy Bitcoin supporters because it is a kind of open attack on Bitcoin and its users. What Is This Opt-In Replay Protection And Why Should You Know About It? Opt-in replay protection is a kind of replay protection that is not inbuilt in SegWit2x’s version of Bitcoin. As a user, you yourself need to opt-in and apply for it. This was proposed by Jeff Garzik, the developer of SegWit2x. It has been highly criticized because it will put users’ funds at risk. As a Bitcoin HODLer, you should know about this because if you do a transaction on either of the chains without “opting in”, then your coins on the other chain will be at risk. Anyone will be able to pick up that transaction and “replay” it onto the other chain, and you will lose those coins. Check out this must-read piece written by Bitcoin developer Jimmy Song: How Segwit2x Replay Protection Works. But as of now, at the time of writing this article (mid-October 2017), we’re not so sure that all of these groups are still supporting it. Let’s also not ignore some notable Bitcoin pundits (like Roger Ver) who claim that SegWit2x will be far more successful in gaining the majority of hash power and are betting millions on its success. What The Hell About The Bitcoin Gold Fork? You need not worry as it is unrelated to SegWit2x and has claimed to have replay protection in place. Also, I have done a separate post on the Bitcoin Gold fork for CoinSutra readers, so just sit tight and follow this guide. The same things applies here! Don’t transact for some days after the fork until the dust settles and until one of the parties (SegWit2x or Legacy Bitcoin) puts an auto-replay protection in place. If you still want to transact and want to opt-in for replay protection, follow Jimmy Song’s article on How SegWit2x Replay Protection Works. Don’t keep your coins on a third party exchange where you don’t control your keys. Use hardware wallets like the Ledger Nano S and Trezor to control your coins. If you don’t have a hardware wallet, use software wallets like Jaxx or Exodus to control your private keys. Don’t fall prey to fake websites/wallets demanding your private keys to let you access your SegWit2x coins. That’s all from my side in this article. I will be updating this article time and again with the latest developments on SegWit2x, so stay tuned to CoinSutra. Now its time to hear from you: What do you think about SgWit2x? What will you do with your SegWit2x coins, if you get them? Waiting for your comments!! It is good that this fork is now called off but this has led a sudden spike in interest of users in Bitcoin Cash (BCH), which was formed in August. It currently trading well above $1000 per unit and it is largely due to Roger Ver’s promotion of Bitcoin Cash on the Bitcoin.com. He has also several times claimed the Bitcoin Cash is the real Bitcoin that Satoshi Nakamoto wanted to create. The Bitcoin Cash price is certainly taking off after the Segwit2x collapse and it is quite evident from these memes as well as propaganda by Roger Ver. But we don’t believe in it yet and want to make the new users aware that Bitcoin is Bitcoin and not to get mislead also Bitcoin is not owned by anyone neither-Roger Ver. 1 What Is NYA or SegWit2x? 1.2 Who Is Supporting SegWit2x? What a great article! I have a Nano S but currently have my couple of bitcoins on Coinbase. I will certainly transfer them to the Nano S. However when I have tried it asks whether I want to choose Legacy or Segwit. Before reading your article I was thinking Segwit but now I think Legacy is best in order to keep my coins safe and avoid the possibility of a Replay Attack. Am I correct with my newly found wisdom? Doesn’t matter legacy or segwit you will still be susceptible to replay attacks. Another thing as long as you have the private keys/seed keys you can claim B2X doesn’t matter if you choose legacy or Segwit. Isn’t it smart to sell your bitcoins days before the segwit2X hard fork knowing that the price of bitcoin will fall down? I want to sell them before the fork appears and buy bitcoins if the price of bitcoin had fallen down to make profit. If you are so sure about such series of events then you may go ahead. Another thing that you can do to hedge your position is to sell some HODL some. Also, consider the economics that if your HODL BTC your are entitled to equivalent segwit2x coins too. So make your strategy accordingly and DYOR. I thought you said that the Bitcoin Gold fork was unrelated to the segwit2x hard fork, yet you just refered to “segwit2x coins.” I’m confused. Your right, because of the equilvalent numbers of coins that you get you won’t lose money. What do you think is going to happen when the Segwit2X hardfork appears? What will do it with the price? If the majority of the miners support Segwit2X wouldn’t that make B2X more valuable then the orignal bitcoin? I already read that many compagnis and the picking the side of the legacy BTC. When the Segwit2X hard fork appears and is implemented without a proper replay protection in place it will create panic in the market. The market is anyhow going to dump it and even you can expect a significant hash power shifting there if there is a reduced difficulty on Segwit2x. Another thing that can happen is that prices fall dramatically in case users are replay attacked in absense of proper replay protection. If the majority of the miners support Segwit2X wouldn’t that make B2X more valuable then the original bitcoin? Yes, this can happen. Lastly, its true that many companies are backing legacy BTC but Bitcoin Cash has shown us that a fork can exist. 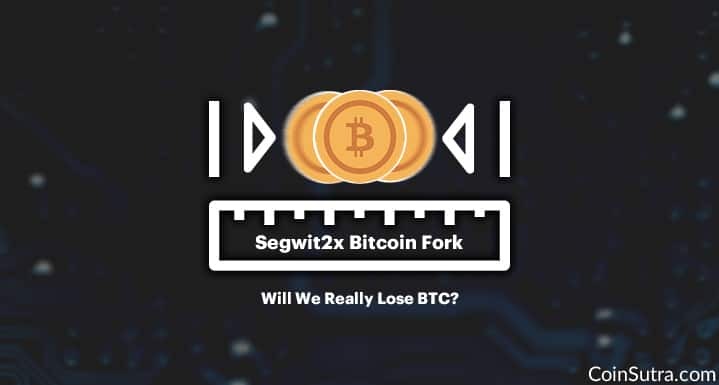 But this fork will be different and interesting to watch for because segwit2x developers say that they are not Altcoin they are Bitcoin and they are doing a bitcoin upgrade. In my opinion, this kind of fork has not happened with any other crypto so it will something dramatic and worth watching. And the one survives and gets more network effect will be ultimately Bitcoin it can be legacy BTC or segwit2x BTC time will tell. You realize you need to be able to predictable crack consecutive blocks to execute a replay attack. Since 85% of the network is singling for the NYA agreement [segwit2x] https://www.xbt.eu/ you’re speaking pretty casually about an ungodly amount of hash power to execute this. Legacy will need its replay protection S2X [BTC] does not have it because it won’t need it. Yeah, I understand cracking the consecutive blocks. But mostly let suppose you are paying a merchant immediately he can replay you if he knows how to do it. Similar ways I have seen double spend also happening and one Tx end up being not included…But that’s an altogether different thing to discuss. And looks like you are saying true for S2X it is getting support, But I am enjoying it, this clearly shows no one can control BTC. I was tracking S2X here this doesn’t show very less support, though. There is no official communication regarding this yet, but looking at the way they did with Bitcoin cash, we are expecting they will add a feature which will make it easier for us to claim other forked coins. Just waiting till Novembers forks are over then praying I can sweep from bitaddress paper wallet with no problems all my coins 4 by then I think Right or 5? Do I have to transfer to another wallet first? That would stink and expose my private key. Just wantto sweep them all to nano S. Can you please explain step by step. Never used my wallet yet (paper). And if Ledger Nano S didn’t support other fork coins then you need to claim them via other supporting wallets through your seed words. If you put bitcoins in a savings account such as BtcPop, will you receive the fork coins as well? Can you trust this service (BtcPop), since one needs to provide their private key? Is the amount of fork coins the same as the amount of bitcoins one owns? So, does your capital double then? Does this mean that it is best to get more bitcoins before the fork? Will the bitcoin price rise before the fork and drop afterwards? Your answers are very informative and of great value! 1)Probably you will not get forked coins if you keep it with BTCPOP because it’s a third-party hosted service. 2)Yes, you get forked coins in 1:1 ratio and your capital don’t double but your coin holdings do double. 3)Yeah, expect a drop and then a rise in price. And it certainly doesn’t mean that you buy more BTC in order to claim these free coins because these coins can be sometimes worthless also. So the real worth of forked coins will be evaluated by the market forces. That’s why adviced our readers to keep their coins in their custody. 4) Glad to know that this piece of information help you. Do you mean a drop in BTC prise and then a rise? Or what do you mean? Because people are afraid of the fork? yup, I mean the same. A drop in price assuming segwit2x doesn’t implement a replay protection but if they implement it then it will not have much effect on BTC. Don’t be afraid just HOLD your BTC with you and in case the other forked coin survives then claim that free money too. There is nothing to be afraid because at the end of the day one version of BTC will eventually survive. One Question. I just bought a Ledger Nano S. I have all my money in an exchange (Korbit). I am going to transfer all Coins from Korbit to Ledger Nano S before the fork. When the fork has taken place (after November 18th), let’s say I wait a week. Do I have to transfer the money back to Korbit to claim my BTC / B2X coins? Or an update comes to Ledger Nano S and automatically adds the new B2X coins to the Nano? Thanks, Harsh. Much appreciated. R.
Does TREZOR do the same update? I only have TREZOR, should i change to Ledger Nano S? Couldn’t get through the question you are asking. If you are asking about Sewgit2x claim on trezor, then yes you will be able to do that but in an unknown time in future. Regarding Hardware wallet, we use Trezor and Ledger Nano both and find Ledger Nano superior in many aspects. If you looking to buy Ledger too then buy it only from their official website. Here few detailed videos on Ledger Nano S that will help you get started with it. I have 1 BTC in coinbase. Coinbase stated that they will support it, however, i am not too sure when will they support. I dont have Nano S or any other hardware wallet, so what are my options if i want to transfer to anything else. The best thing you can do right now is to use a mobile wallet. And transfer your coin to these wallets before the fork. Make sure to backup your seed word carefully. I am using a platform called LUNO. If I leave my coins in the exchange is there a risk of losing them during the fork? Most probably yes. You can download a wallet like Coinomi or Jaxx on your phone and transfer coins to your wallet before the fork. Im new in this and using Bitstamp. What should i do before the fork? What would you recommend? IF you have BTC in Bitstamp then take it out from there and put it in a wallet where you control your private keys or seed keys. I only know of one site where you can have a BTC wallet, coinbase.com; Will I be entitled for BTG through that platform if I purchase before fork? I’m a noobie and I’m very young but I am trying to keep up as much as I can. I have $1000 that I am willing to put towards BTC. Don’t know if I should just be investing $100 a week until the fork or wait until after to invest it all hoping there is a dip. All feedback is much appreciated, positive or negative. Can’t thank you guys enough for your time and insight. Coinbase has only stated to support segwit2x yet and that too has no ETA. They have not stated anything on BTG. So keeping your BTC in Coinbase in the hope of getting BTG from them would not be a wise decision. Regarding your 1000$/100$ investment, one thing I would like to tell is that, if you invest after fork you won’t get BTG or Segwit2x coins either. Im new in this and using Bitstamp platform.What should i do before the fork (for not losing the double coin)?What would you recommend? @ROI IF you have BTC in Bitstamp then take it out from there and put it in a wallet where you control your private keys or seed keys. Before fork keep your BTC in a wallet where you control either private keys or seed words. THANK you so much, I’ll do so.. Sorry for the question but how can I keep them safe form attack? Wait for solid replay protection until that time don’t transact in BTC after the fork. Amazing article, it definitely clarifies lots of things and it helps a lot. Also the replies on most people are very helpful. Maybe just to ask you guys, but I’m like a beginner in trading (in cryptocurrencies) and I’m curious in what the hard fork of October 25th will do to the price of BTC. Will people automatically sell their BTCs because of the high value? Do you guys recommend following some important pages/websites/blogs/youtube or something like that to really keep an eye open for BTC expectations (analysis et cetera)? People who are doing day trading or short term trading will definitely sell BTC when they get their price target. It happens all the time and it’s unrelated to fork. Hi, thanks for being very informative and helpful. I have a comment, and beware I’m a bit of a rookie. I don’t know the difference between all wallet types, however I got a friend (nerd) helping me to move my bitcoins to a wallet before the new fork. 1. I’m uncertain when the actual fork will happen is it the 25 October? or november 16? 2. If I decide to move my coins from an exchange to just an ordinary USB and I’m in control of my private keys, how do I then receive free Bitcoin Gold? will they just appear on the USB flash drive? I hope you can answer me, even tho it might be a rookie beginner question. I kinda just jumped right into a few cryptocurrencies, without complete knowhow. I will advise you to go through some basic blog posts on CoinSutra. One of the purposes of CoinSutra is to help you and many alike in understanding this whole ecosystem. So make use of it. Cheers ! 1) There are two forks happening one is in October and another in November. 2) If you are holding your keys then you will need to import it into a Bitcoin Gold compatible wallet after the fork to access your Bitcoin Gold. Read this for Bitcoin Gold instructions – Bitcoin Gold Fork Coming: How To Double Your Bitcoins. Another advice- Coinomi/Ledger Nano S is a good wallet to hold BTC to quickly access your Bitcoin Gold. If I keep my BTC with blockchain.info wallets, can I get the new coins after the fork ? You need not worry about that as with blockchain.info you control your private keys/seed keys. But until now blockchain.info or any other wallet haven’t claimed to support segwit2x coin so I will suggest wait and keep an eye here because anyways if a fork happens you will be able to claim fork coins through another wallet that may support segwit2x in future. Read more about Blockchain.info stand on Segwit2x here. Do you have to owe one whole bitcoin to get bitcoin gold? Or, will you still get bitcoin gold if you only owe partial bitcoin like .5? You will get Bitcoin gold on partial holdings too. I’m keeping all my BTC in bitfinex and I use 2FA (email+mobile) and all BTC withdrawels require my email verification. Do I still have the risk of losing my coins by replay attack? Oh no I didn’t know about the October 25th fork only the one in November and the one that happened in July. My coins are in Coinbase.. I guess it’s too late for me to get Bitcoin Gold. I will move them to exodus now while I wait for m Ledger nano S.
Sad to know that but if you are lucky and BTG’s blockchain becomes stable then Coinbase will give your BTG sometime in future. BUt there is not assurance or ETA for that according to their official statement. tell me if i am right: in case there is enought consensus, will be only b2x coin. Bitcoin legacy will disappear. How high need to be this consensus?. Seems like they are going to do it without consensus also this time. I just started using a Ledger Nano S. it asked me if I wanted to use Bitcoin legacy or Segwit. I chose Segwit as it was what was recommended. Will I still receive the B2x coins or should I have done Legacy. I moved all my coins from Coinbase into ledger yesterday. I was not able to take adventage of the other forks but I intend to be prepared for this one. I have watched your video on ledger nano but still have questions. You did the right thing and also there is no such restriction brought forward yet by segwit2x devs that only legacy holders will get the forked coins. If anything as such comes up then will update it here. I had a small amount of coins in Coinbase during the BCH fork and have been waiting for them to split them for me on January 1st. If I transfer them to a hard wallet before this will I lose the BCH? Great article! No, you will not lose BCH if you transfer BTC. However, coinbase will give your BCH only when you had BTC on it at the time of fork. Hi Sudhir, thanks for the article and all the advice you’ve given in the comments. I haven’t read them all yet because I wanted to get my question in, but I will once I’ve posted. If I find the answer in other comments, great, if not I hope to hear what you have to say. I am the quintessential noob, just getting into the market, but from what I’m reading online it sounds like now is the time to get bitcoin before the hard fork so that you get double the coin. Am I reading correctly? I’ve purchased a portion of a bitcoin, a few eth, and some litecoin via coinbase at this point, and I have some cash moving there right now to play with. The purchases are supposed to be in my coinbase wallets by November 7th or so. My plan, based on what I’ve read so far, is to offload them all to my Ledger Nano S and wait for a few weeks before doing anything with them. Am I reading correctly? Lastly, once the dust settles after the fork, pardon the noobness but how do I claim my forked coins? I’ll see if you’ve already responded to this question by reading the rest of the comments but thanks for the reply. -You will only double your two variety of coins. Let say you had 1 BTC then after fork you will have 1 BTC and 1 more forked coin. -your understanding is correct if you are new don’t anything and hold your Bitcoins in your control. -Regarding accessing your forked coins, it is still not clear which wallets will be supporting segwit2x so wait until that comes and we will update it here. You are an incredibly patient human. I cannot believe how many people asked you the same question you clearly answered 50 times. They are replying to your answer with the same original question!!! Glad, may be your comment makes a difference. If i dump all my segwit2x coins on bittrex the minute i get them , how will i exposed my btc transacting to replay ? I wont have any coins in the other chain to replay ? First thing Bittrex is supporting or not segwit2x is yet not clear. You will be susceptible to getting replayed for your BTC and please read about replay on our blog. Any user storing Bitcoin on Coinbase at the time of the fork will be credited with an equal amount of the new Bitcoin2x asset on the Bitcoin2x blockchain. No action is required – we will automatically credit your account. What will happen, when i store my coins on Exodus Wallet with controlled private keys. Any chance to get this B2X coins in the same way ? So far exodus will not support 2x at the moment, but maybe other wallets? No not on Exodus. I told exodus because here you control your keys. Regarding coinbase I don’t think they have any ETA for it. Please give me the source of such statement. Hi so if my Bitcoin is in my mobile wallet jaxx how will i receive the bitcoin2x when the fork happens??? Wallets that are supporting segwit2x is yet not clear. So wait we will publish how to claim it as soon as it is clear. I have my bitcoin on paxful and am using all kind of protection on it. I need advice from you, do i need to sell my bitcoin before the hard fork happen or leave it there? You should move it to your own wallet. MyCelium or Ledger Nano S.
What is the difference between these “hardforked coins”, and an altcoin such as LiteCoin? If you hold them in your own wallet for example a hardware wallet is that true? I thought that for this to happen you have to keep in in coinbase for example. You can do at your own risk because I don’t think there is any ETA from Coinbase for this. Am a total crypto noob so please forgive this question in regards to the Mycelium wallet. This wallet only holds Bitcoin, right? So if I deposit Bitcoin into it before the fork, how is it that the new Segwit2x coin (whatever they will name it) will show up in this wallet for me to access? Mycelium will not show segwit2x. To see segwit2x coins you need to import your mycelium seed words into a segwit2x supported wallet. Hello Sudhir, in all of the above conversations no one has mentioned Trezor. I keep my Bitcoins on Trezor but Trezor has made no comments thus far on supporting SegWit2, in fact I’m pretty sure they are against as developed by Satoshi labs SO should I consider moving my coins to a different wallet?? No wallet has claimed to give your access to segwit2x coins early. So I don’t think that will help. But if you see in past Ledger Nano S is the quickest wallet to give access to Bitcoin Cash..so maybe this time also. But this is just an expectation seeing the past performances. Thanks for this informational website. I am planning to buy my first bitcoins and am happy to read about all this information right now. Am planning to buy this week, moving my BTC to a Ledger Nano S. If I get it right, they will foresee an update so that I can claim my Segwits on the Nano S aswell? Another question: when buying a Nano S, I wonder what happens to my bitcoins when for instance the Nano S suddenly dies? Do I lose them? Do I buy a new Nano S and can I re-access them? Yeah if Ledger Dev team updates then you will get segwit2x coins. And if you store your coins in Ledger Nano S then you will get your seed words/recovery phrase, with this seed you can anytime re-access your coins if the device dies. Please I need answers. I have bitcoins in my coinbase wallet and Luno too, does it mean i will lose them during the hard fork? Nope, you will not loose until you do some mistake. Since this fork is a 2nd part of SegWit2x, When SegWit was put in place I didn’t have coins but now if I hold BTC(&keys) by this fork time , will I get SegWit cons ? What you are not mentioning is the centralization of Segwit2. If miners get together and sign an agreement, that pretty much tells you that miners are controlling/owning the block chain. Changi block size is only a temporary bandaid to a much larger problem.